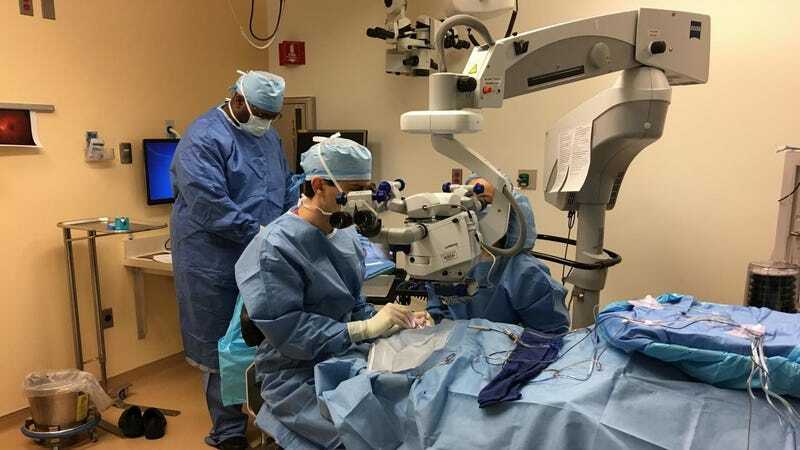 Dr. Jason Comander operates on Jack Hogan’s left eye at Massachusetts Eye and Ear, on March 20, 2018. On Tuesday, a 13-year-old boy from New Jersey was at the center of medical history as he became the first person in the US to receive an FDA-approved gene therapy for an inherited disease. The event marks the beginning of a new era of medicine, one in which devastating genetic conditions that we are born with can be simply edited out of our DNA with the help of modern biomedical technologies. The therapy, Luxturna, from Spark Therepeutics, was approved by the FDA in December to treat a rare, inherited form of blindness. Its price tag, set at $850,000—or $425,000 per eye—made it the most expensive drug in the US and sparked mass sticker-shock. But the therapy, which in high-profile clinical trials has allowed patients to see the stars for the first times, also offered the almost miraculous possibility of giving sight to the blind. Massachusetts Eye and Ear is one of eight medical centers certified to perform the gene therapy. Several more procedures are already slated to take place across the country in the coming weeks.